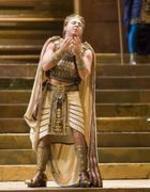 In a bizarre incident Sunday night at the world-famous opera house Teatro Alla Scala in Milan, during a performance of Giuseppe Verdi's Aida, the featured tenor Roberto Alagna simply walked off the stage after only twenty minutes. Alagna was booed by a small but very vocal section of the opera crowd prompting him to pick up and leave. His understudy, clad in blue jeans, rushed on-stage to complete the performance. Not surprisingly, the Teatro Alla Scala says it will never allow Alagna to sing on its stage again. On a segment for NPR's All Things Considered, co-host Robert Siegel spoke with Enrico Girardi, a music critic for the Italian newspaper Corriere della Sera, about the strange event. My wife and I were fortunate enough to attend one concert at La Scala in 1995 while we lived in Varese, which is only 45 minutes or so northwest of Milan. The concert was memorable only in how bad it was, but the opera house was stunning and more than made up for the cacophony of sound known as modern symphony which we clearly were not sophisticated enough appreciate. If you're in the area, it is definitely worth the effort to get a ticket to a show to experience this living piece of Italian history.